The Datamath TI-2511 was manufactured solely in Spain and uses an identical construction to the TI-2510 featuring its unique beige housing. 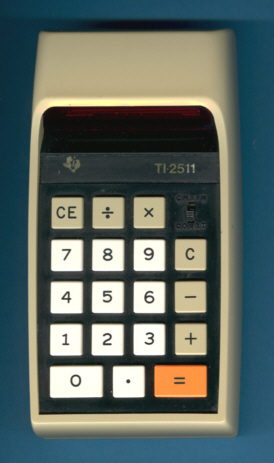 The featured TI-2511 was assembled in December 1974 in Spain and sports a handwritten serial number with a leading "AE" instead the "ME" known from our first TI-2511. © Joerg Woerner, February 17, 2011. No reprints without written permission.